CCHRs International Human Rights Award was presented to author, investigative journalist, broadcaster and producer Gary Null (top) and to Sandra Everett, left, pictured with CCHRs Bruce Wiseman. Everett founded Citizens Rescuing Youth, a group that frees children from psychiatric facilites. The awards ceremony featured a performance by vocalist Raven Kane. hen the Citizens Commission on Human Rights celebrated its 26th anniversary this year, it marked the occasion in Los Angeles with awards presented to international leaders in the cause of human rights. The event was attended by 450 people, including leaders in medicine, human rights, government and education. 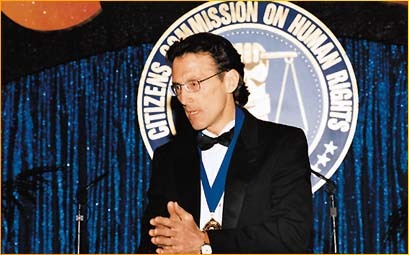 Awards were presented to Gary Null and Sandra Everett in recognition of their human rights work. Psychiatry betrays its patients with promised help that it never delivers and commits fraud in staggering amounts $40 billion each year just in the United States, he said. 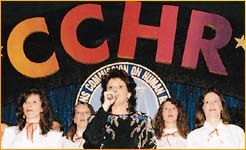 That is $1,333 every second of every day. Jan Eastgate, international president of CCHR, described the worldwide activities of CCHR, including psychiatric atrocities uncovered in South Africa. Information recently brought to light showed that between 1975 and 1989, 1,451 women in the hands of South African psychiatrists, many of them between 10 and 19 years of age, were sterilized. Eastgates recent travels to South Africa included work with political, legal and human rights representatives to investigate psychiatric abuses so that those responsible can be brought to justice and to ensure such atrocities do not happen again. The South African government has announced that a national inquiry is to be held with public hearings in each of the countrys nine provinces.